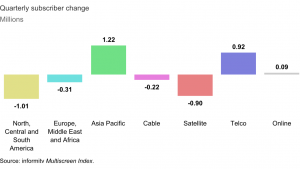 The total number of TV subscribers to the top 100 services globally fell for the first time during the third quarter of last year, according to the latest version of Informitv’s Multiscreen Index. According to Informitv, subscribers to the top 100 fell by 0.11 million in the quartrer, down by 0.02%. only 43 of the 100 services reported subscriber gains, the smallest proportion to date, according to Informitv. Informitv reported a decline of over a million subscribers across North, Central and South America. In the EMEA region, the number of subscribers also fell – by 0.31 million – for the first time. The top 10 services in the US lost 877,000 subscribers, leaving them with a total of 82.72 million between them, led by Comcast, with 20.98 million and DirecTV with 19.63 million. Apart from online services, AT&T U-verse was the only service to gain subscribers, with a modest increase of 13,000. Canal+ International recorded the biggest loss overall, with 608,000 subscribers leaving after the summer’s World Cup. However, Canal+’s subscriber total was still up 726,000 year-on-year. Sky, now combined with Comcast with a total of close to 44 million subscribers, did not report separate subscriber numbers for the quarter. Losses in the Americas and EMEA were partly offset by gains in Asia Pacific, with a total that was up by 1.22 million, boosted by 200,000 additions at Dish TV India. In terms of platforms, cable lost 0.22 million subscribers while satellite lost 0.9 million. Telco television gained 0.92 million. Online services Sling TV and DirecTV Now added 26,000 and 63,000, with totals of 2.37 million and 1.81 million respectively. 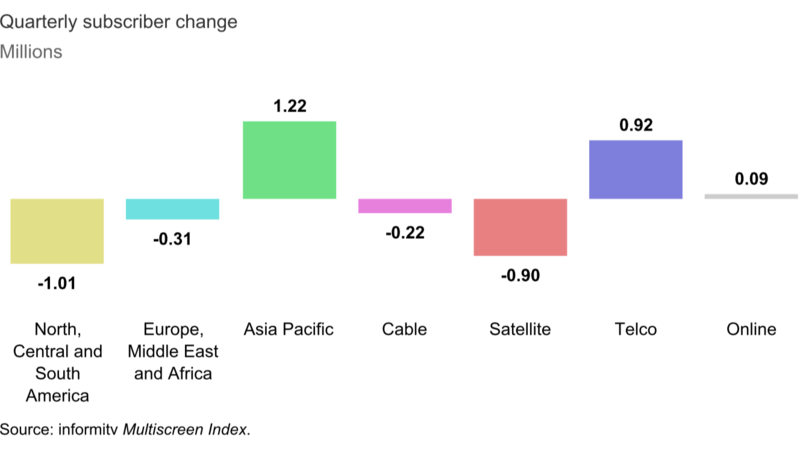 “Our Multiscreen Index shows a slight fall in television subscriber numbers worldwide for the first time, following average quarterly growth of 1% over recent years,” said editor Dr William Cooper. “The third calendar quarter tends to be weaker. The key question is whether the next quarter will show a recovery or continuing decline.